Multi Graphics, founded in the year 1996, at Okhla (New Delhi), is Manufacturer and Service Provider of a variety of OMR Evaluation Software, Online Test Series, Online OMR Software, E-Learning Software, E-Learning Portal, Online Exam Portal, School Management System, School Management Mobile App, Qr Code OMR Sheet, Barcode OMR Sheet, Litho Code OMR Sheet, OMR Sheet with Anti Copy, Unique OMR Sheet, Attendance OMR Sheets, Live Video Class, Smart Class Solution, OMR Sheet Scanning Software OMR Scanner etc. In addition to this, we are offering services such as Assessment Support and Data Management System. To finish the complete business undertakings in a rationalized way, we have industrialized a contemporary infrastructural facility. This unit is subdivided into research & development, marketing and inventory control, procurement, production, quality-testing. Our enterprise is proficient with an avant-garde fabricating unit that is well-armed with the contemporary equipment and machinery Due to our innovative fabricating facility; we are able to offer an unmatched collection of products that are perfect in all traits. In order to keep pace with the present technical progressions, new proficiency is regularly added to our producing facility. To confirm trouble-free production process, we have a crew of highly trained personnel. Our crew comprises development experts, sales & marketing executives, designers and researchers, trained labors and quality supervisors. Every member of our crew possesses huge proficiency and awareness to handle all production undertakings with contemporary technologies and machinery. Our team members work on harmonization with each other to complete the pre-defined objectives of our business. In addition, they understand the precise demands of our valued patrons and carry out the production process consequently. Paying extreme courtesy to accomplish superlative patron fulfillment, we follow principled business approaches and suitable modes of dealings. Supervised by our brilliant mentor, Mr. Pravin Sharma, we have been able to receive a great standing for ourselves in the business. Due to his stern business administration and sharp business acumen, we have thrived in accomplishment an edge over our opponents. Manufacturing and Trading of Computerize Stationery. Sprawling state-of-the-art infrastructure available with us is our greatest strength and helps us in making on-time delivery of bulk orders. Our manufacturing unit is equipped with latest machinery and other equipments to offer flawless finish. We are backed by a team of well versed professionals who take care of all production aspects and quality management. To ensure proper flow of the processes in the industry, we have segregated our complete work force into small departments to take proper care works assigned to them. We are involved in manufacturing a wide range of high quality Software and Pre-Printed Computer Solutions. Holding a huge clientele, we are moving ahead towards the ladder of success. 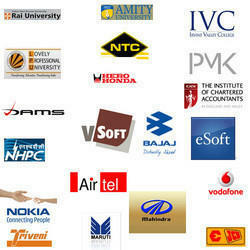 We have more than 200 satisfied clients in India and abroad. We are backed by a team of well experienced and highly qualified professionals coming from diverse background having expertise in different fields. People working with us have supported us at all the times to write a story of success and make our presence feel in the industry. We have a team of research and development people responsible for conducting research and quality analysts to control quality of our products. Our solution is different from other product available in market. We have more than 10 years of experience in OMR industry. Our research and hard work put in develop a unique OMR software that works similar to OMR scanner and cost less, gives the same accuracy with speed. We can read the same OMR form used by the expensive, space consuming OMR scanner. We make any normal scanner to become OMR scanner with almost no cost. "Multi Graphics Group ' vision is to bring credible and genuine services, assessment, and training and employ ability to various aspects of education, training and employment. Multi Graphics Group strives to help institutions and companies from choosing the 'right' individual rather than the 'best' individual and provide overall support in all prospects.